While I had a lot of fun heading into the city last week to see Bumblebee, it wasn't quite what I wanted to do. I still wanted to make the trek all the way into West Edmonton Mall and spend some gift cards. I also had a very specific goal in mind as to what to spend those gift cards on: calendars. Man, calendars seem to be one of those things that are dying out now that everyone has one in their pockets at all times thanks to smartphones. But at work, I still like to have one on the walls of my office. It helps keep me organized to lift my head up from my computer and see all the looming deadlines. Last year, I even got one of those laminated ones that you can write stuff on using whiteboard markers. I swear, it's how I've stayed organized ever since college. But that's just in my main office. I do so much work at work that I'm constantly flitting about from room to room, and I need new calendars in offices numbers two and three. And it's just that time of year when the calendar pop-up stores are starting to clear out their inventory, and everything's half-off. So I snatched up Castles of Germany for my main office, Star Wars for office #2, and a second, writable calendar for office #3. Then it was time to spend some gift cards. I went on over to the Scotiabank Theatre to see Aquaman. Man o man, as I was riding the escalator up the theatre, I had a frightening thought. The Scotiabank Theatre in West Edmonton Mall is going to be celebrating its 20th anniversary this year. It opened with much hype in the summer of 1999, replacing Famous Players' old West Mall 5 theatre. It was the ultimate movie theatre in Edmonton, with its fire-breathing dragon, stadium seating, and curved screens. And THX! To date, the only times I've ever seen that famous THX trailer on the big screen was in those early days at the Scotiabank Theatre. Of course, being the summer of 1999, the first film showed at that theatre was The Phantom Menace. I remember seeing the line for tickets on the news. The line wound down the staircase and around the indoor lake. The first movie I saw in the Scotiabank Theatre, though, wasn't The Phantom Menace...it was Austin Powers: The Spy Who Shagged Me. Although, you may remember, it had a fantastic Episode I-spoofing trailer. But, the old Scotiabank Theatre was showing it's age. As I settled into my chair, it sure felt kind of small when compared to the gigantic, super-comfy recliner that I enjoyed at the Landmark Theatre for Bumblebee. It's still a very good theatre, though. Aquaman is bug-nuts, bonkers insane, man. They lean heavily into the fantasy elements of Aquaman, creating a very lush looking film. We are treated to some spectacular computer generated underwater empires as we see Atlantis and all the kingdoms under the sea. And the final battle...as mush as I tire of the massive CGI armies fighting each other, this one has armoured sea life. Sharks vs giant seahorses. And the kraken shows up. It's beautiful. It's a pretty standard Aquaman plot. 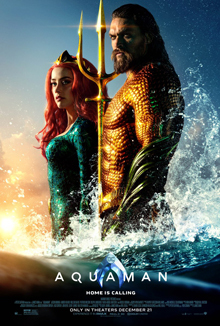 Aquaman's half-brother Orm, the ruler of Atlantis, is seeking to unite the seven kindgoms under the sea and raise an army to go to war with the surface world. So, to stop the war, Aquaman has to challenge Orm for the throne. Which sends him on a quest for a magic trident with Orm's forces hot on his tail. And one thing I keep forgetting to mention is they film actually has a really meaty subplot delving into the origins of Aquaman villain Black Manta. It almost feels like an entire second movie, and I found the whole thing quite compelling. But yeah, I really enjoyed Aquaman. Between this and Wonder Woman, it looks like the DC Cinematic Universe is starting to find its footing. I give it 3.5 Nibs out of 4. Full review on the website.